When performing preventive maintenance or addressing a recall on IV pumps, Deaconess Gateway Hospital personnel spent hours scouring the facility to locate the right pieces of equipment. At the same time, the hospital was purchasing an average of 12 new telemetry packs each year—at over $1,000 each—due to accidental loss of these highly mobile devices. 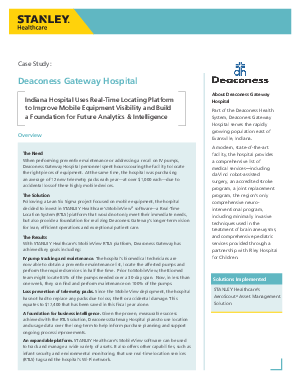 Read this white paper to learn more about how Deaconess Gateway Hospital is using a real-time locating platform to improve mobile equipment visibility and build a foundation for future analytics and intelligence.